Goal: For 1 week, dedicate at least 30 minutes a day to rest and relaxation. Accomplish this goal: Part of avoiding burnout is dedicating time to ourselves unrelated to teaching. I’ve struggled with this many times throughout my life, because I am passionate about what I do. I have often used my passion as an excuse to spend too many hours on projects, lessons, or events related to teaching and failed to dedicated time to my mental, spiritual, and physical health. When we love what we do, I find we actually work so much more because we don’t want to stop what we are doing. The challenge to dedicate 30 minutes a day to rest and relaxation will be difficult for many of us who love what we do, but the challenge is important in creating healthy habits for our a mental, spiritual, and physical health. 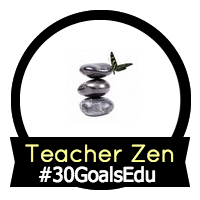 In my book, The 30 Goals Challenge for Teachers, I write about my struggle with burnout and depression, which were all part of the lack of time I dedicated to myself. Each year, I get better at dedicating time to myself and I feel this makes me a stronger and better educator. In my interview below with Tyson Seburn (@Seburnt) we talk about ways to avoid burnout. Listen to the short interview with tips to help you with this week’s challenge. Previous Augmented Reality, Virtual Reality and Wearables for Learning! Oh My! I am going to take the challenge! I have your book and I’m going to start reading it. Does that count as 30 minutes of relaxation? Also, I took today off and spending it with my husband💖. Next Saturday with my girls and their sons.